If you are a long time reader, you might remember my story of a woman I happened to overhear venting to the cashier at a pet store about housebreaking her new puppy. (I say “happened to overhear” like I wasn’t stuck there waiting for her to vent when I just wanted to check out and go home, but that’s a whine for another day.) The woman in question had recently adopted a new puppy, and apparently she thought that all puppies show up already housebroken. Her cart was full of pet-grade odor removers and puppy pads. “Don’t they learn that from the mother dog?” she kept wailing. No. No they do not. Housebreaking is something that every dog has to learn from a human, because it’s not a natural action for them. Think of going potty outdoors as a trick that dogs must learn, the same as fetching a ball or sitting on command. If it were up to the dog, they’d just find a nice spot somewhere nearby, do their business, and go on with their day, without the hassle of having to go outside – just like humans! Putting aside my annoyance at the check-out line lady, I get the feeling that most people know that a dog needs to be housebroken, but that a lot of people don’t really know how to go about doing it. We’ve talked before about housebreaking an older dog, but today I wanted to refresh our memories on seven ways to finally housebreak younger dogs and puppies specifically. Just remember with all of these tips that patience and consistency are the keys. Whatever method you choose, stick to it! Probably the most popular method, and most foolproof method, for house training a dog, is to create train. This means that your dog will be taught to sleep and hang out in his crate either during the night, or when you aren’t at home. The reason this works: Dogs don’t naturally want to potty in the space where they sleep. The crate is their space to sleep, so they’ll hold it until they can get to another space. If you make sure that they always go straight outdoors after leaving their crate, they’ll learn to associate the outdoors with potty time. The key however is that the crate cannot be too big. You have to choose a crate that is just large enough for your dog to turn around in and lie down. Any larger, and your puppy may decide to relieve itself in one corner and sleep in another. This does mean that you need to plan to buy multiple crates as your puppy grows – the crate should always fit them as they are in the present moment to avoid accidents. Ask any vet and they’ll tell you that a puppy’s digestive system is strangely like clockwork. Puppies are almost always ready to go to the bathroom about 15 minutes after eating, drinking, sleeping, or playing. After any of these activities, set an internal timer and then get outside. Obviously, this doesn’t mean you should be rushing home every 15 minutes all day to let your puppy outside. And it also doesn’t mean that your puppy won’t have to go to the bathroom except for the one time after they eat, drink, sleep, or play. The rule of thumb is that puppies can hold it for about an hour per every month of age. A three-month-old puppy can only hold it for about three hours. As you can see above, very young puppies can’t hold it all the way through the night. It’s important that you stay consistent throughout the night at first, to avoid accidents. This helps drive home the fact that the outside is for potty time, and your pup won’t start to associate any area of your home with a bathroom. Don’t worry, this isn’t forever! It only takes about six to eight months for a puppy to be able to make it through a whole night. I don’t personally think there’s anything wrong with using puppy pads as a backup or for mess control. For example, if the only crate you could find is just a hint too big for your puppy, and you’d rather keep the inevitable clean up easy, I can see putting a puppy pad down. Also, if you know that you work long hours, and have decided that it’s in your dog’s best interests, I think it’s better to offer them a specific spot in your home to “go”, rather than getting mad at them for not holding it all day. 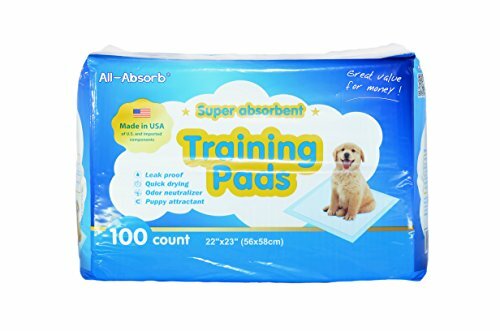 Puppy pads are designed to prevent the dog from tracking wetness around with them, and they also soak up odors so your house doesn’t smell like pee. All that being said, many trainers think that using puppy pads when you don’t have to can be detrimental to the training process. All you are doing is confusing the dog, who needs absolute consistency to learn the behavior you’re trying to teach. Do you want your puppy to learn to go outside fast? Then you need to go overboard when it comes to the praise and rewards for good behavior. Dogs are generally eager to please. They’ve been bred to be companions and helpers for humans, so they have an innate sense of pride and “rightness” when they are doing something for us that we deem “good”. When it’s time for a potty break, take your dog outside to the same place where he has been going, and wait for five minutes. If he uses the bathroom in that five minutes, give him immediate praise and even treats if you prefer. Don’t take him right back to his kennel even if you have to go back to work. It’s important that you schedule about another 10 minutes of play or relaxing together, because he could see an immediate return as a punishment for the bathroom behavior. Only going to the bathroom when you are not around, so you won’t know when or where the deed occurred till it’s much too late. Holding it for so long they get an infection. Confusing the message when praised for going outside. This can make it take even longer for a dog to become fully house trained. If you are struggling to get your puppy to stop peeing in the house, you may need to consider this approach, used by many trainers. First, choose a space in your house where you won’t be too upset by messes. The laundry room, for example, is a popular choice. Make this area your puppy’s domain, and continue working with them on going outside very consistently. The more they are able to keep the area you’ve confined them to accident-free, the more space you allow them to be in. Try adding new rooms to their allowed space once a week, should they manage to go a full week without an accident. If accidents start back up when they’ve earned more space, you simply restrict them back to the original space. Keep following a potty schedule and offering rewards or praise when they do go outside. The point of this technique is more to keep the messes confined, but it does also help to eliminate behaviors like hiding to go to the bathroom. So now that you have my seven best tips for housebreaking a puppy, let’s talk about something that you’ll definitely have to deal with at least once: messes. It’s inevitable, and if you’re able to keep your cool and not punish the puppy, it’ll go a long way towards getting them housebroken sooner. I remember getting very frustrated the first time I had to housebreak a dog, probably because I was a kid. My parents told me that if I didn’t take care of the dog myself, and make sure it didn’t mess up the house, they wouldn’t let it stay inside with me at night. So anytime the dog had an accident, I would immediately get panicked because I wanted my friend to sleep in my room. Keep dog bags on handy if you don’t have a lot of plastic grocery bags on hand. Honestly, if you walk your dog, you’ll need to have dog bags anyway. If you can get to the poop right away and scoop it up, it won’t leave a smell or stain. recommend this Rocco & Roxie spray. I’ve used it for years and it really does a great job of getting rid of the smell. Have a heavy-duty pooper? Get a swivel bin and a rake. If your floor is hardwood, tile, concrete, or you’re cleaning up messes in a grassy area where you didn’t want your dog to go, this is a must. 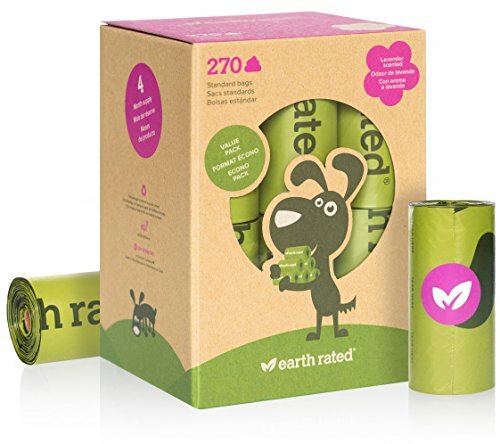 This is also really good for keeping the yard clean so that no person accidentally tracks in a dog mess. Try the good old vinegar and baking soda routine for a natural cleaning method. First make up a solution of half vinegar, half water and pour it over the spot where the dog had an accident. Use paper towels to absorb the moisture. Keep putting down fresh paper towels till there is no more moisture to absorb. This is better than scrubbing, which just spreads the smell and mess around. drying. Then vacuum up the baking soda. This method is very helpful for getting a dog to stop having an accident in one spot, where the smell of previous accidents makes them think it’s okay to go to the bathroom right there. Does your house smell like dog pee but you can’t figure out where the accidents happened? 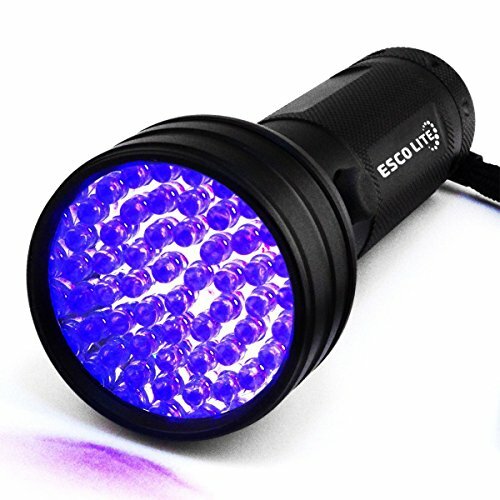 You can always get a black light flashlight that picks up urine stains. Just be prepared to see some stuff that you may wish you hadn’t – such as the presence of bed bugs! Housebreaking a dog is essential if the two of you will be living together long term – and even if you won’t be, this skill will make a dog’s life much easier in the future. However, there are some breeds that don’t take to housebreaking very well, so be sure you’re keeping up with that consistency and patience. Getting upset won’t help any dog learn to go outside. It may take some time, but you’ll eventually find the right combination of techniques for potty training your dog. Now let’s all just hope the lady from the check out line at the pet store was able to do the same for her new puppy.